In 2008, Pleasant Bay Boat and Spar undertook an extensive restoration project for the Orleans Historical Society. The 1946 motorized lifeboat, CG36500 was managed by Pete Kennedy and his crew of volunteers for OHS and maintained through donor contributions and a lot of volunteer labor. 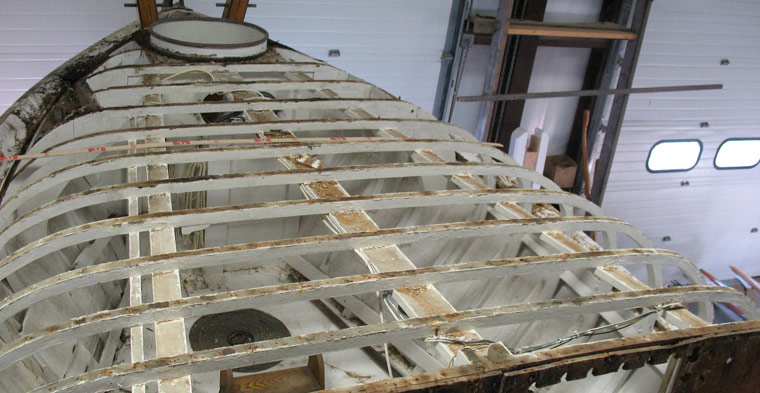 The last professionally managed restoration work was in 1996 at Pease Boat Works in Chatham. That phase included structural work from the keel up to the rails. Now it was time to tackle the turtle backs (cabins) cockpit soles and side decks. The 36500 arrived at the shop in November 2008. The crew of volunteers began dismantling the bulkheads, floors, turtleback sheathing and side decks down to the frames, pulling out thousands of copper rivets and carefully preserving the integrity of the sub structure. By the New Year, the crew of Pleasant Bay Boat and Spar were ready to take over. Frames were patched and plugged, then sealed with penetrating epoxy. New fir side decks were installed. 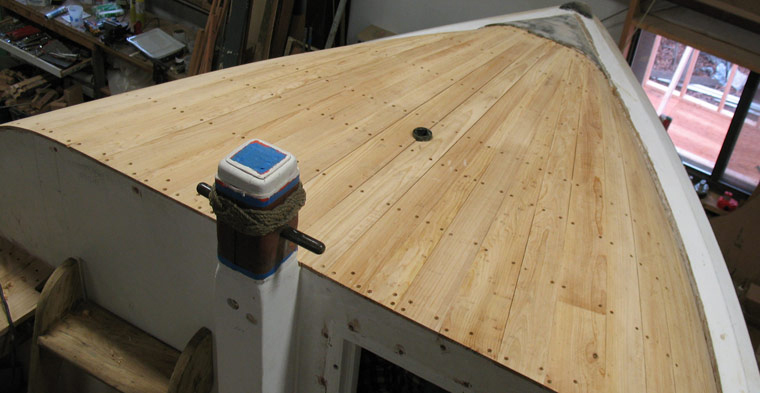 The bulkheads were replaced with ¾" Okoume plywood. The cockpit sole needed to be reframed, and then replanked with new VG Doulas fir. The turtlebacks proved to be the most interesting. The original cabins were double planked with two layers of cedar, riveted together, then sheathed in canvas. We replaced the first layer with Atlantic white cedar planks; we opted to cold mold the next layer with two layers of cross diagonal 1/8" veneers of Spanish cedar set in West System epoxy. This method saved further undo stress on the already fragile frames, and in fact completely reinforced the entire super structure. They were sheathed with Dynel and West System epoxy, making a lasting non skid, water tight surface. 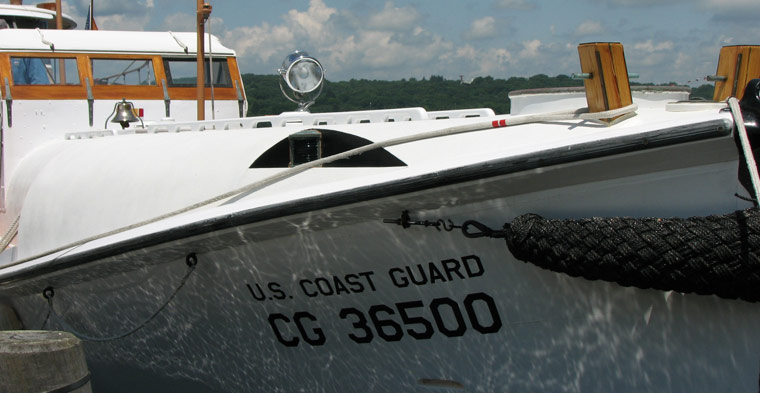 In May 2009, the CG36500 returned to her home waters at Rock Harbor, Orleans, but not for long. In June Pete Kennedy motored the CG36500 from Rock Harbor through the Cape Cod Canal towards Mystic, CT, where she was proudly on exhibit at the Wooden Boat Show. 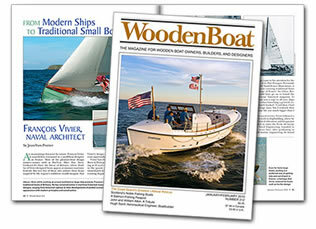 In January 2010, the story of the rescue and the restoration was the cover article in Wooden Boat Magazine. If you want to learn more about this historic vessel and the rescue read The Finest Hours or Two Tankers Down or visit www.CG36500.org.